Erika Tietjen is a founding member of Oakland-based sassy indie folk band T Sisters. Along with her sisters, Erika got her start in music through musical theater and family immersion. In March the T Sisters released an EP produced by Oliver Wood (The Wood Brothers) and are currently traveling in Egypt, Israel and Morocco as part of the selective State Department-sponsored program American Music Abroad, performing and conducting workshops on girls empowerment and social issues. 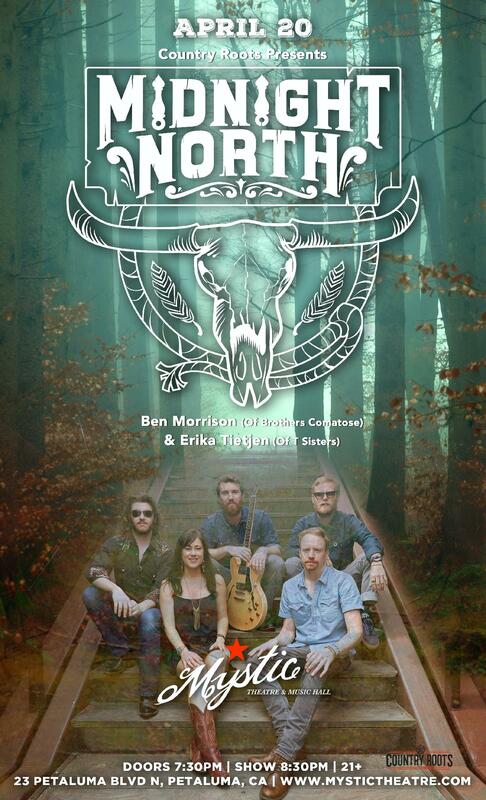 Northern California native Ben Morrison has been compared to a young Kris Kristofferson, a male counterpoint to Amy Winehouse, and chunky, spicy peanut butter. His tones are smoky, soulful and timeless, embodying the old spirit of country and the contemporary soul of rock and roll. Currently, Morrison is working on his debut solo LP while continuing to perform with his band The Brothers Comatose, bringing his unique combination of classic and contemporary sounds to audiences everywhere. Erika and Ben have been collaborating for years through the T Sisters and The Brothers Comatose and their duo takes elements from their other projects in the intimate context of harmony-based duets.